Use discount code REGIN20 at checkout for 20% off Regin products! 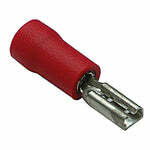 The Regin Ignition Lead Connectors are female connectors, pre-insulated in red for wires measuring 0.5mm to 1.5mm and come supplied in packs of 10. The high quality crimp terminals feature a flared entry hole for easy location of the cable/wire and are compatible for use with the Regin Ratchet Crimping Tool REGB80.